(Newser) – Michael Bloomberg has stepped up his calls for tighter gun laws in the wake of last month's Colorado massacre, but to his frustration, not many people seem to be listening—especially not President Obama and Mitt Romney. The argument that gun carnage can be stopped with existing laws—as both candidates insist—is "preposterous," the New York City mayor tells the Huffington Post, but the "irrational" gun lobby has made it too daunting for politicians to even discuss gun control. The gun lobby has "created this aura that they are so powerful, if you don't go with them, they'll take you out and destroy your ability to feed your family," he says. Machine guns in the hands of lunatics makes America great and strong! The politicians have seen the numbers of increased gun sales since Obama went into office, along with the number of increased households with guns and recognizes that they would be fighting a loosing battle if they attempted to control guns now. Look at the reaction of people in Colorado, they didn't turn in their guns, they bought more (and some were first time buyers). 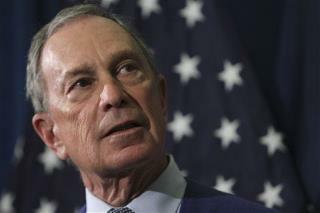 If (let me control your life) Bloomberg is for gun control, I know it is right to be against it. Do not smoke, drink soda out of a large glass, and if you are a working mother, get you A55 home and start breastfeeding. Oh and don't buy a gun on the way. Those are reserved for criminals.